Who is that singer in the Hersheys Commecial? Discussion in 'The Lounge' started by BigMike, Sep 13, 2005.
she is REALLY hot. Who the hell is it? Turn your tv off and ride your bike. Are you all ghey??? Have you really watched American Idol. Nevermind, I think I already know. full metal jacket was such a good movie. Actually, we have chickens and camels here too. *edit - we ride horses every where too. I have my spurs on now. 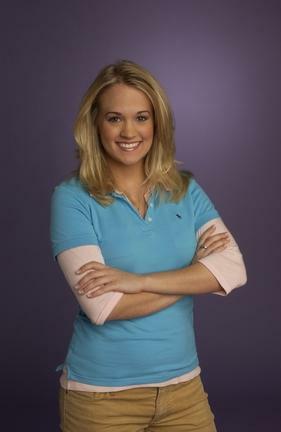 Carrie Underwood, says my girlfriend. She was the girl that Jenn was cheering for on the last round of American Idol. Yeah, she's pretty cute. Decent voice, too. It sounds like Raising Helen has taught someone a lesson. *edit - we ride horses every wear too. I have my spurs on now. edit ... every wear huh?????? oh PUHLEASE mr. i have a 15.78 post a day average. You had a chance to think about this and you still got it wrong.... very disappointing coming from you. You lose all grammar and spelling complaint rights for the day. I heard that. I hear that Faith Hill was talking about you as well. ug, i can't stand that girl. i voted for bo. you coming to devil's den? Werd yo. Me and Aaron are shooting for getting there around 11 or 12 on Friday. We got a site over in the A campground. We could share if you promise to keep your redneck shenanigans to a minimum. I need to get my beauty sleep. Are y'all showing up Friday for practice runs? Cool. Depending on your behavior, we can decide if you can share the campsite. Just kidding, you know that you and V are welcome.